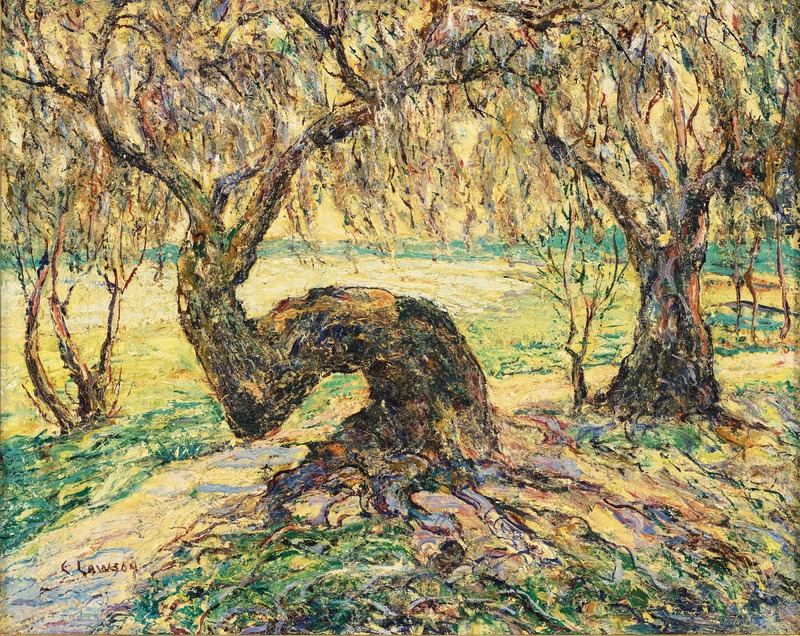 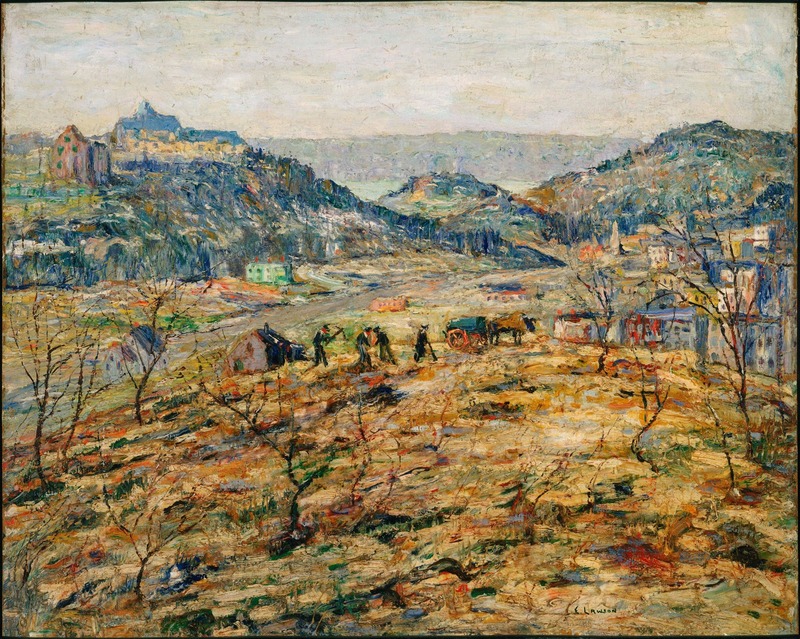 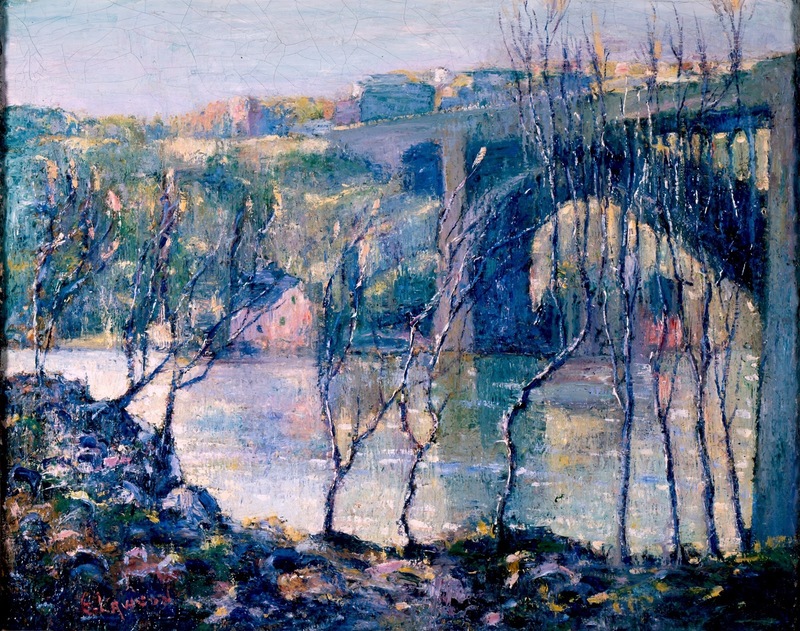 Ernest Lawson (1873-1939), a progressive artist and member of a group of artists called The Eight, achieved early recognition with his impressionist landscape paintings but later in life experienced personal tragedy and artistic isolation. 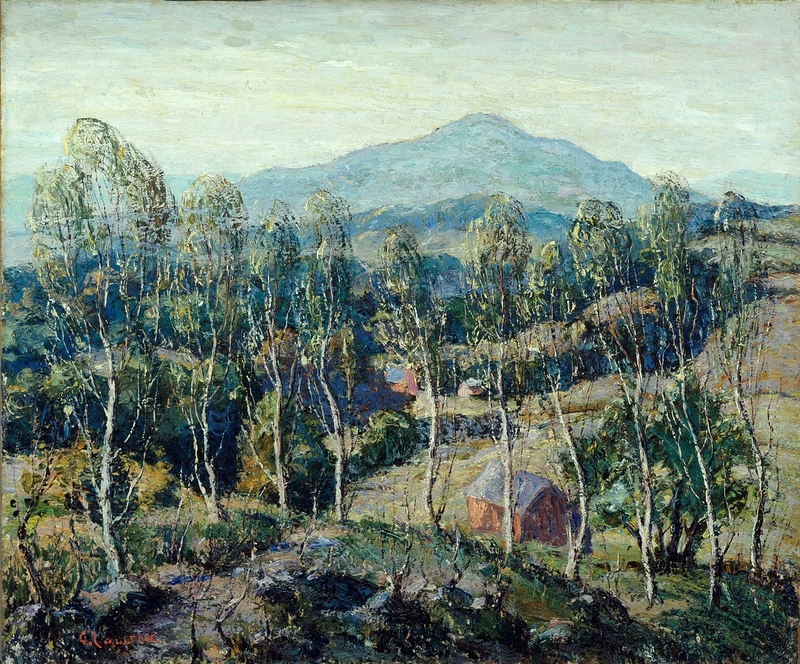 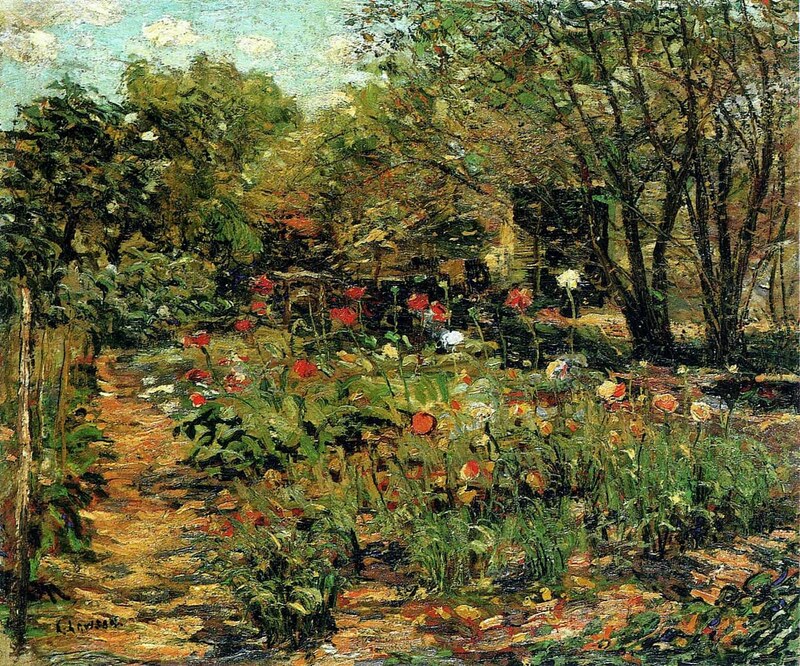 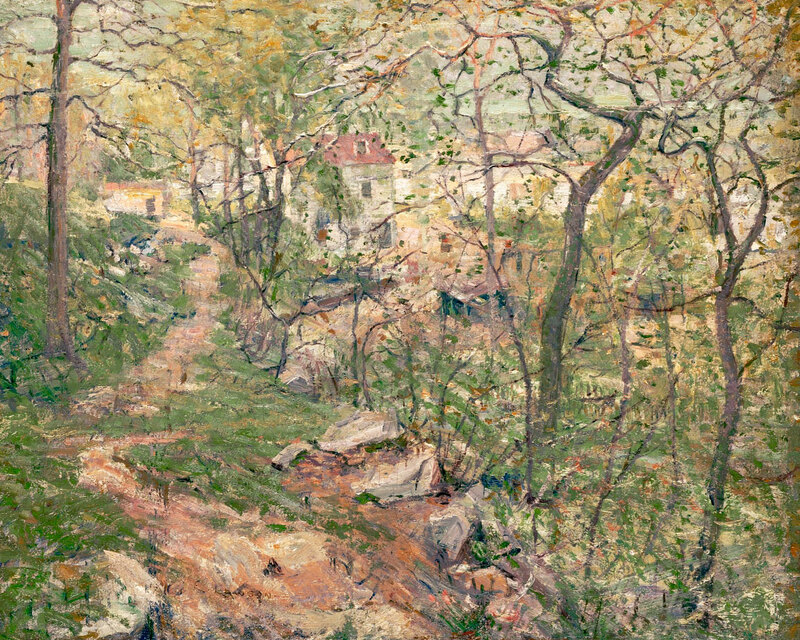 Born in Nova Scotia in 1873, Lawson studied at the Art Students League, New York, from 1891-1892 and took summer classes in Cos Cob, Connecticut, under J. Alden Weir and John Twachtman. 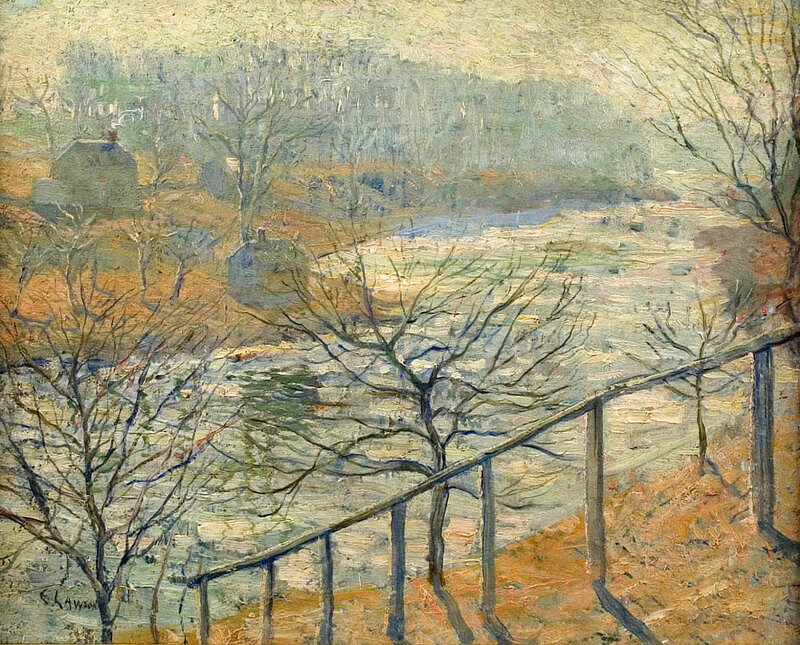 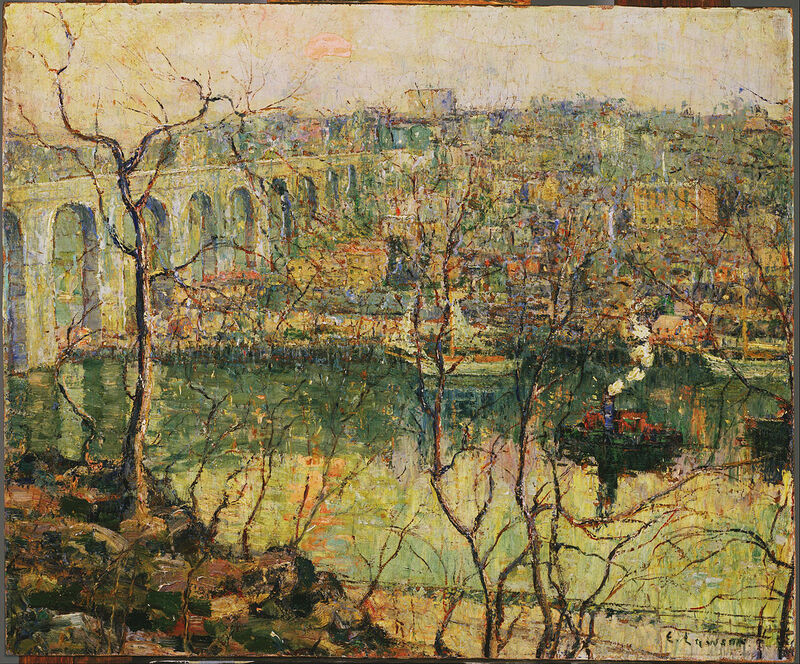 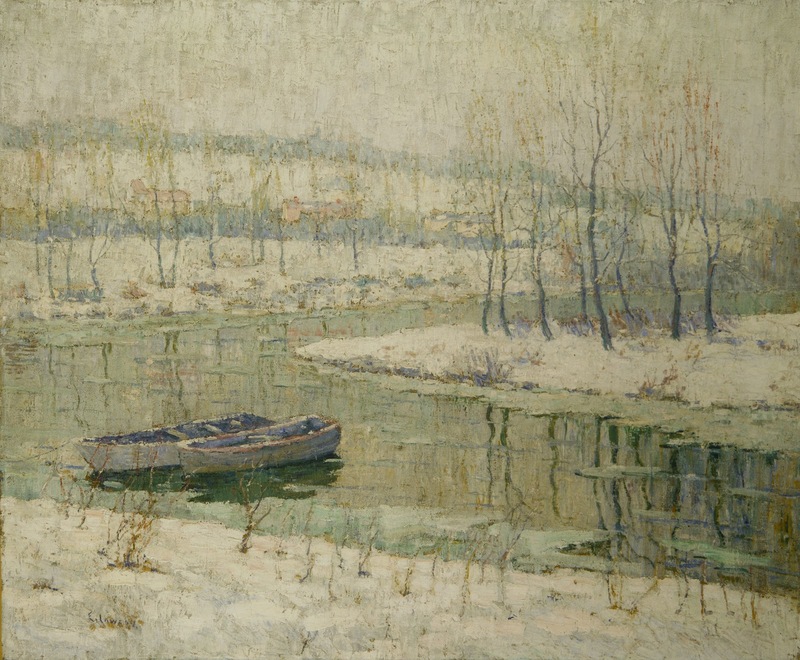 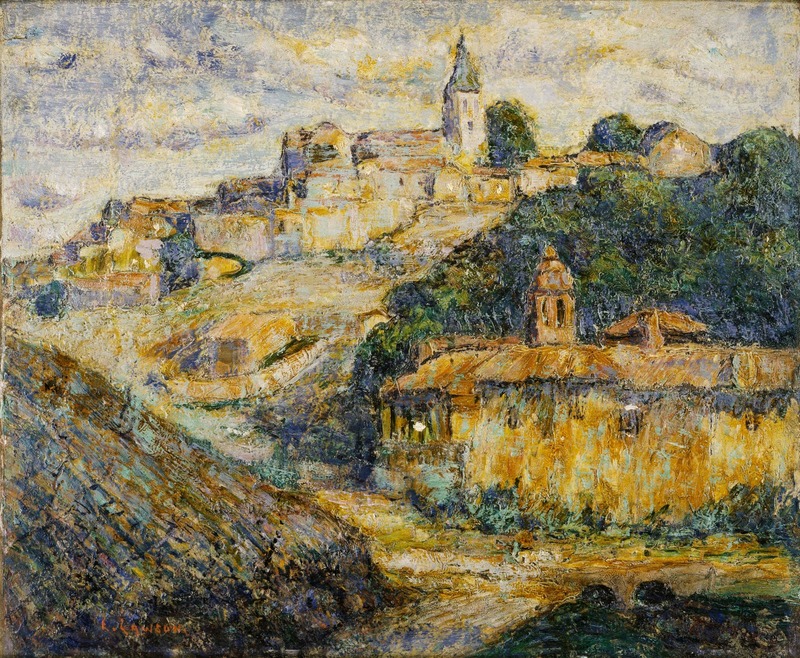 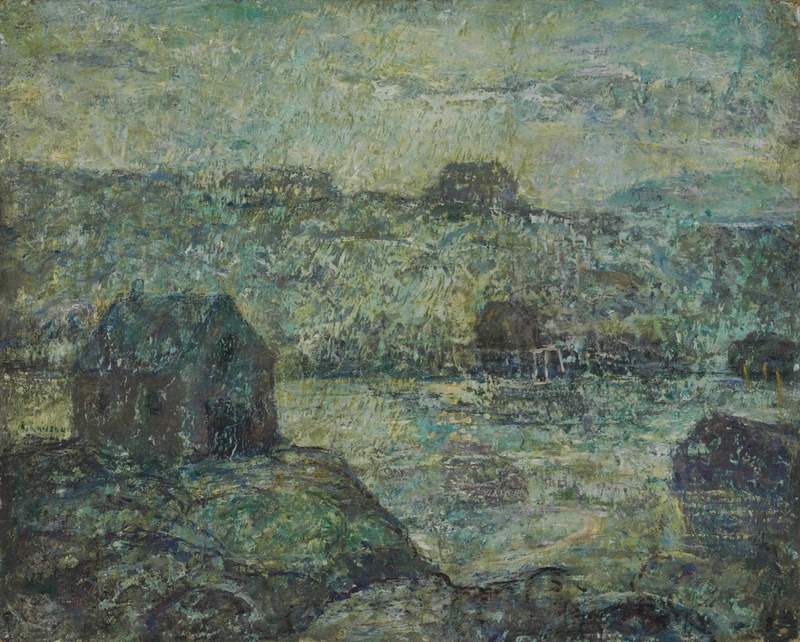 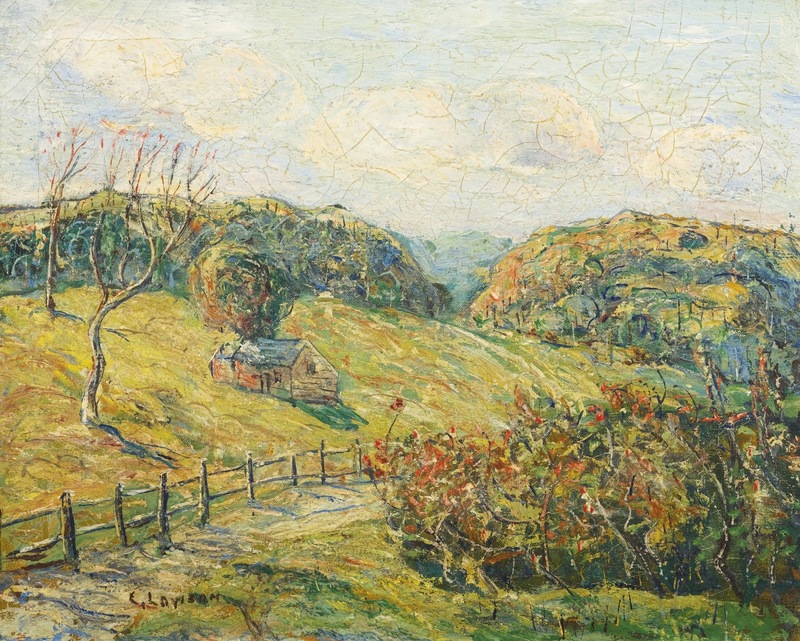 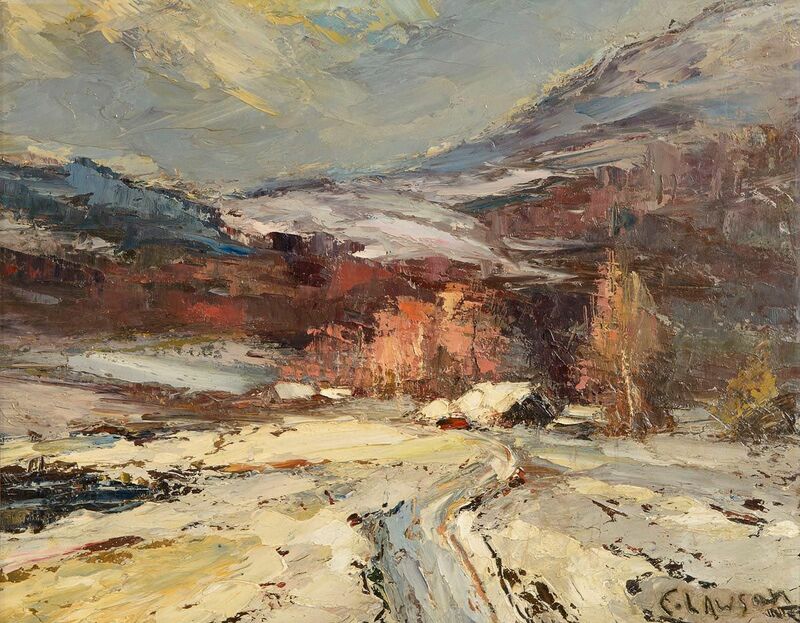 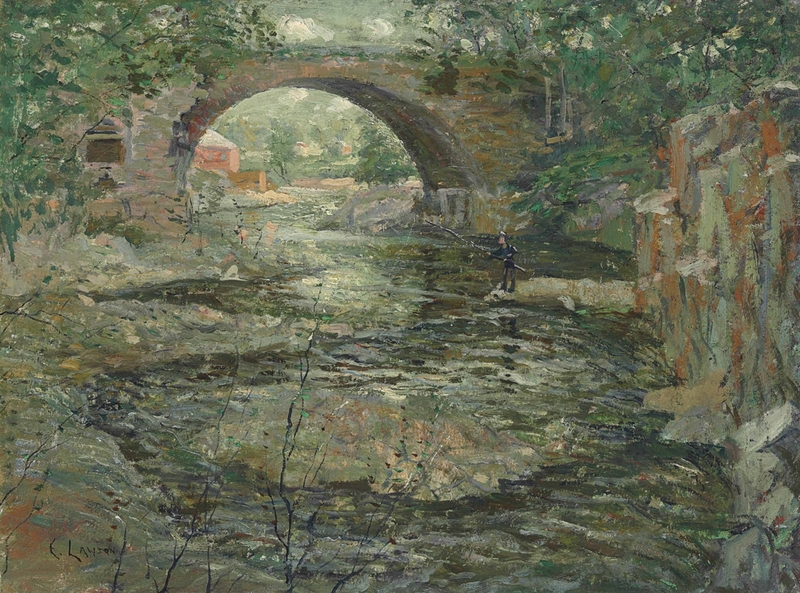 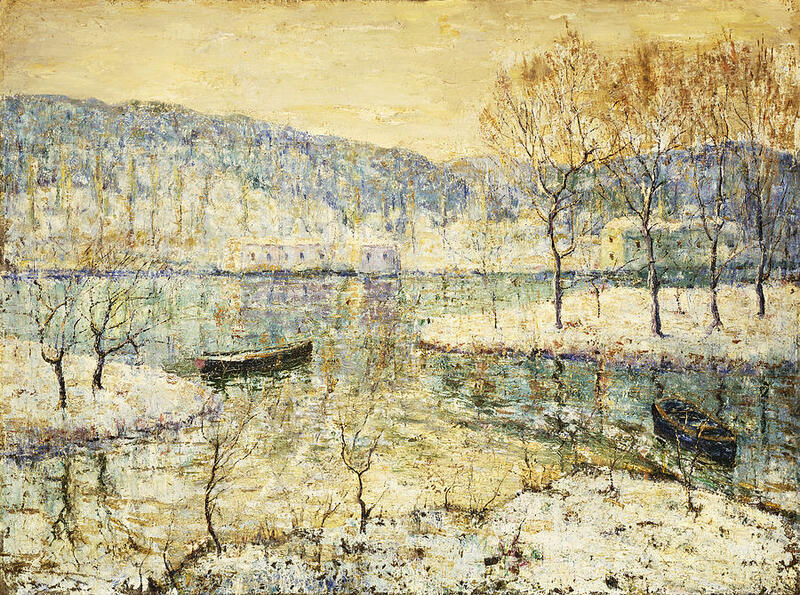 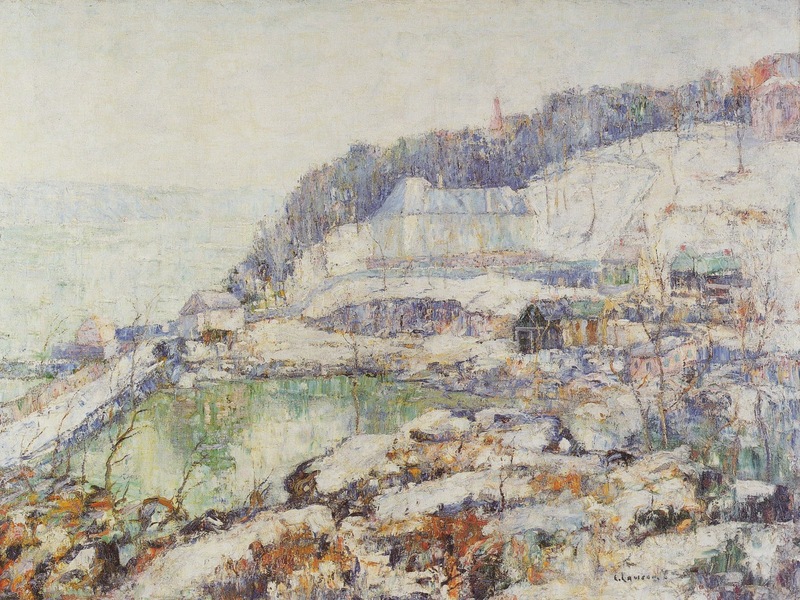 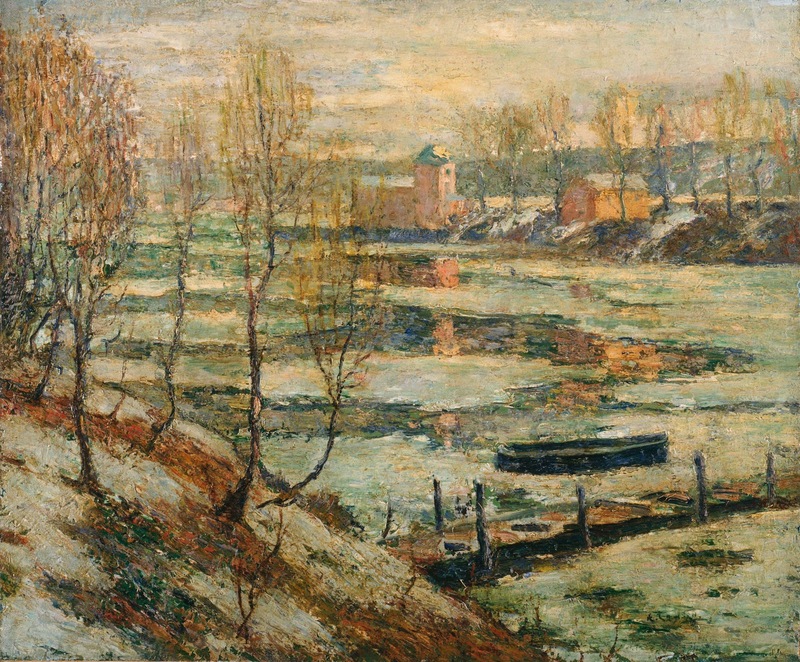 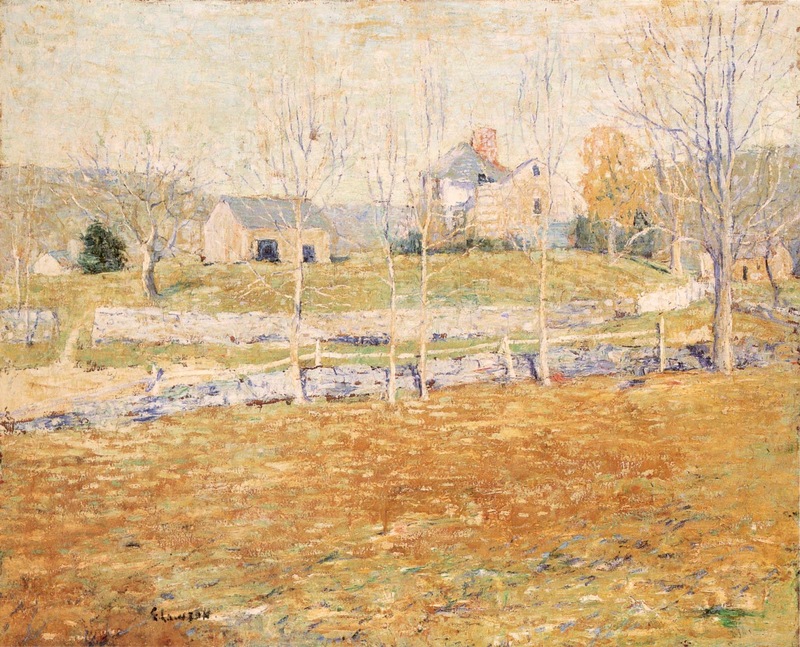 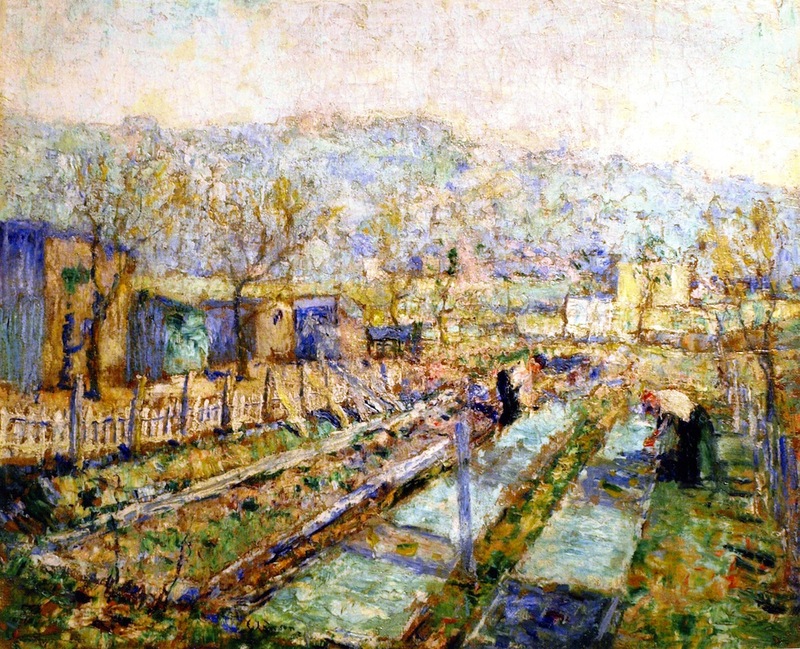 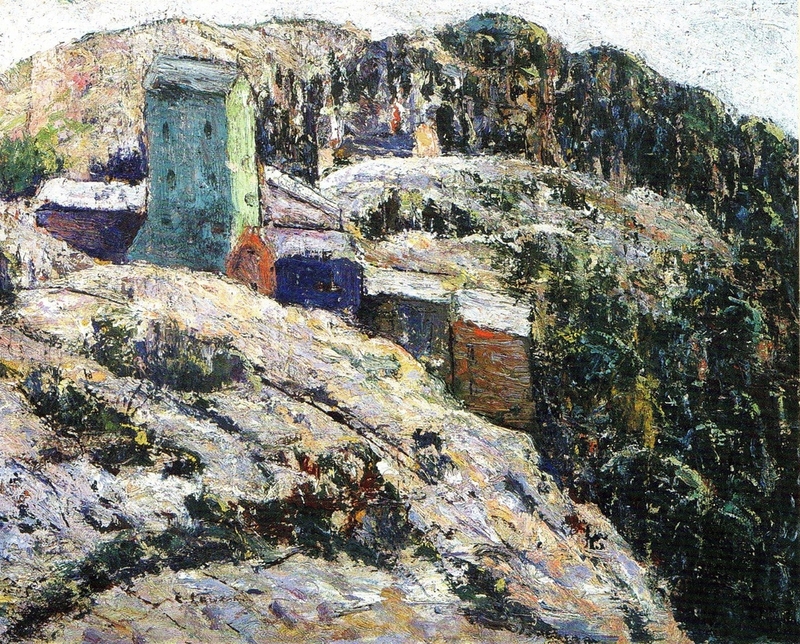 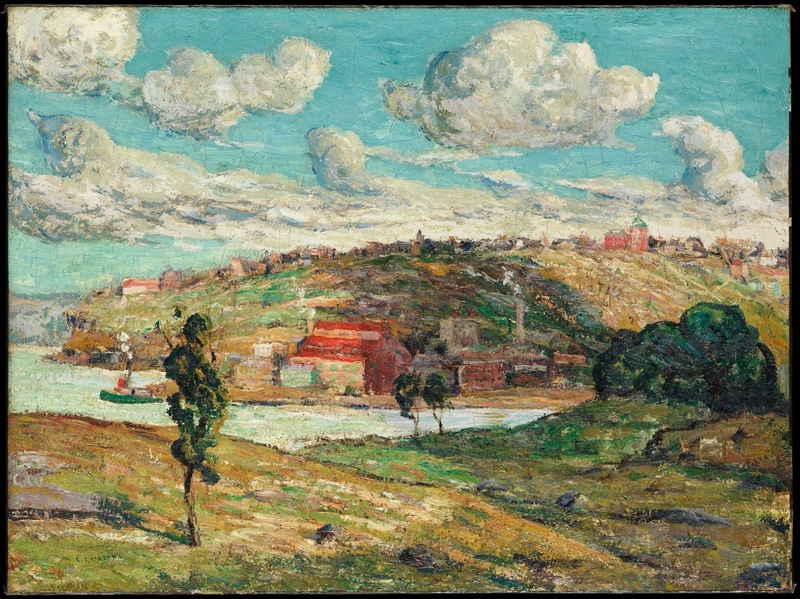 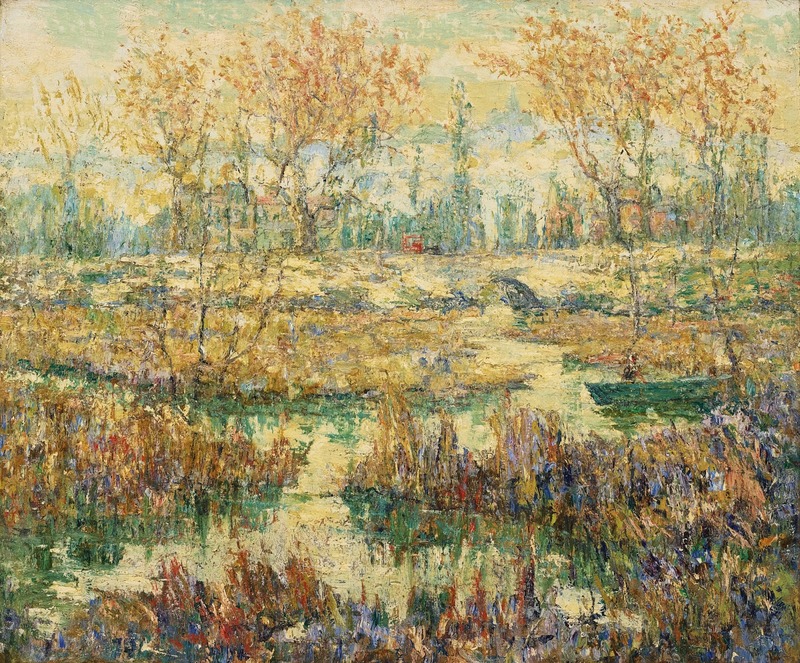 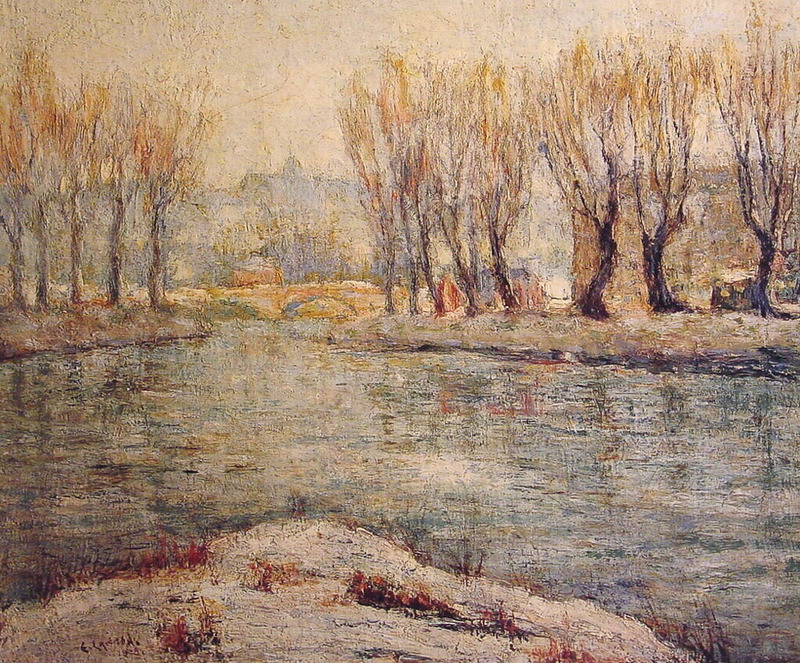 Lawson’s early work has delicate tones and harmonious textures reminiscent of Twachtman’s style. 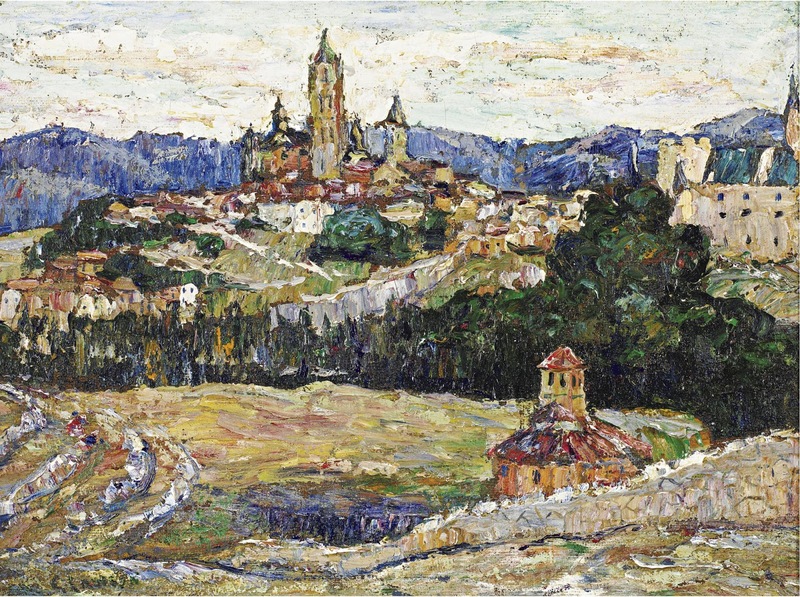 While living in France from 1893-1896, Lawson briefly attended the Académie Julian. 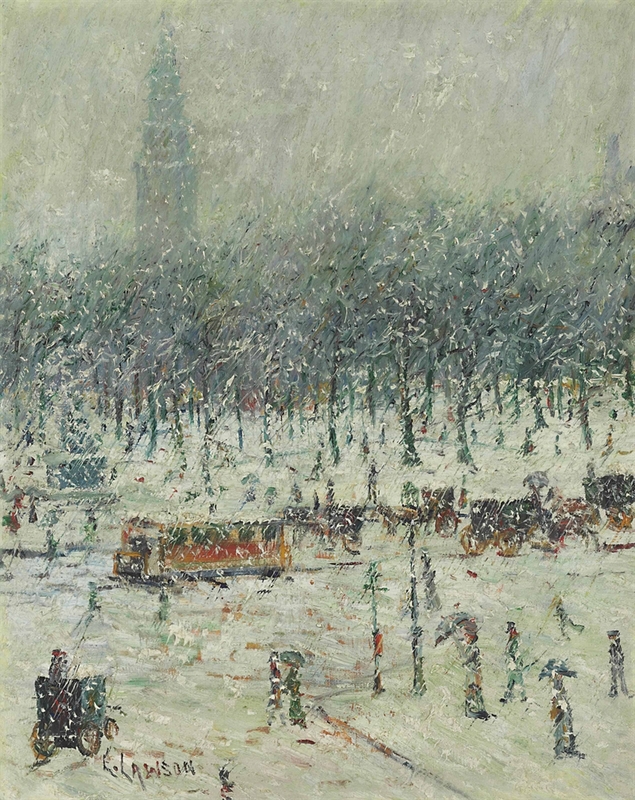 During this time, he met the Impressionist painter Alfred Sisley, an encounter that confirmed Lawson's love of painting outdoors, and his first success came when the Paris Salon accepted two paintings in 1894. 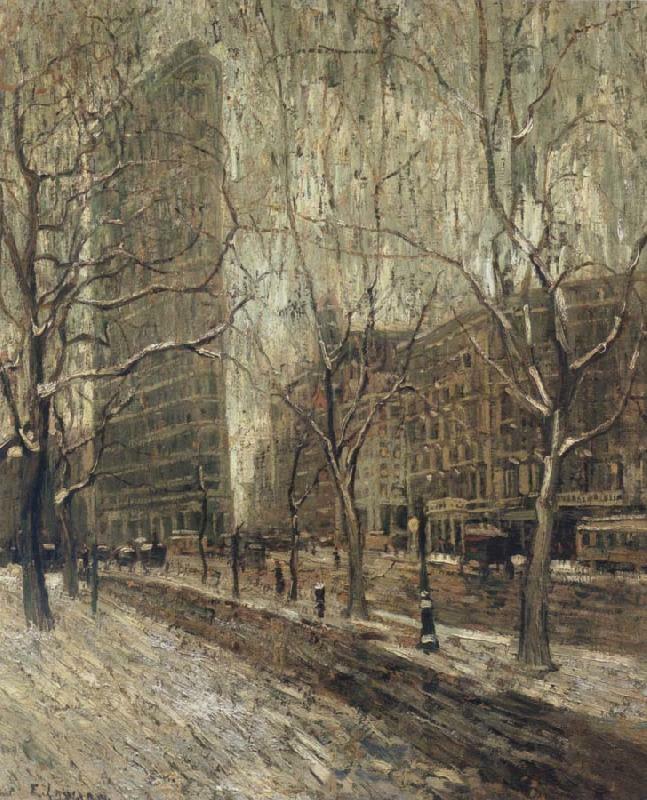 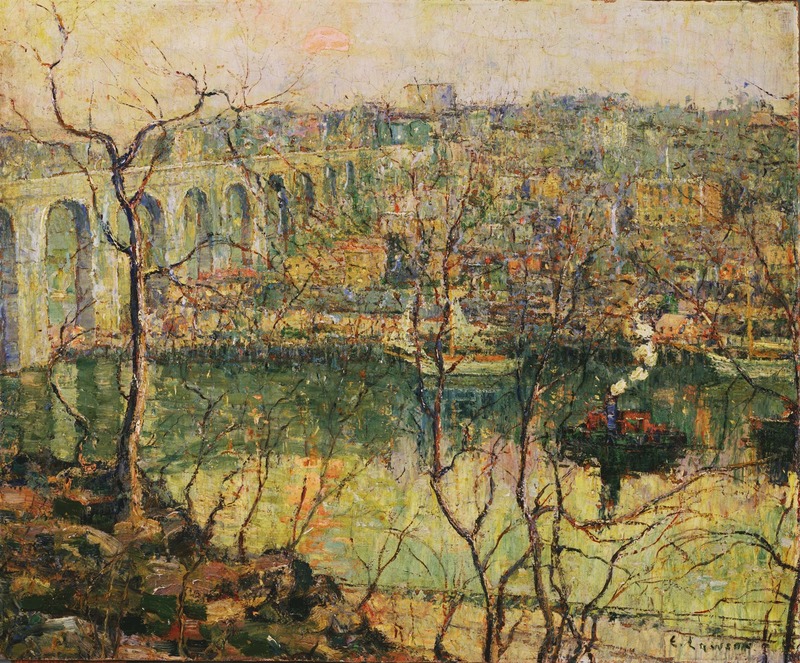 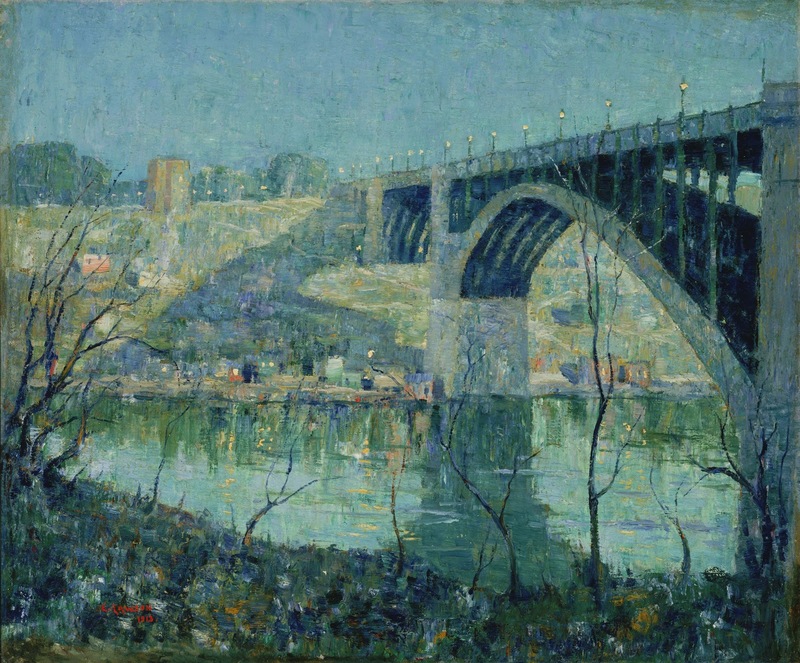 Returning to New York in 1898, Lawson concentrated on certain sites of upper Manhattan-their light, seasons, and times of day-a body of work that marked the height of his career. 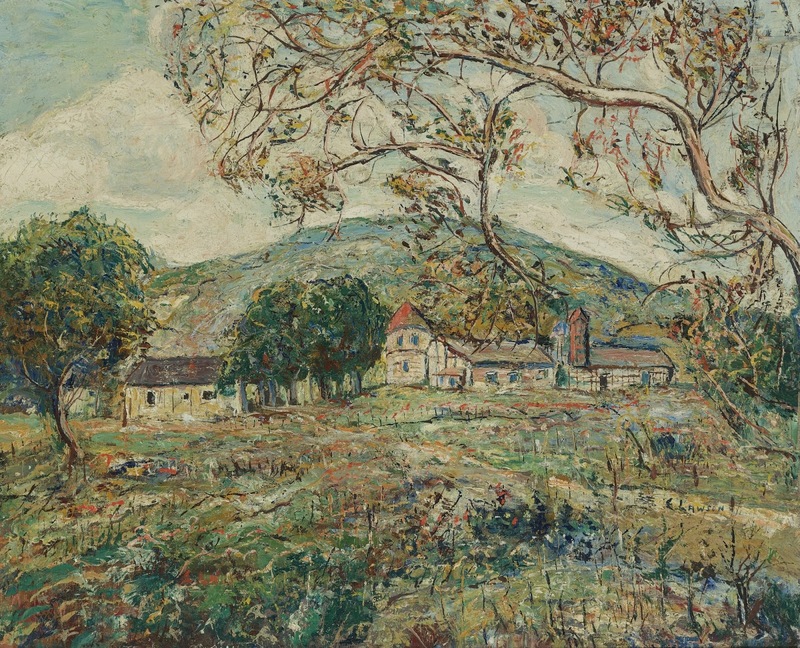 These characteristic works depicting the semi-industrial landscape of New York and the lower Hudson River employ thick impasto, strong contour lines, and areas of bold, yet harmonious color to create highly structured compositions that appeared quite progressive at the time. 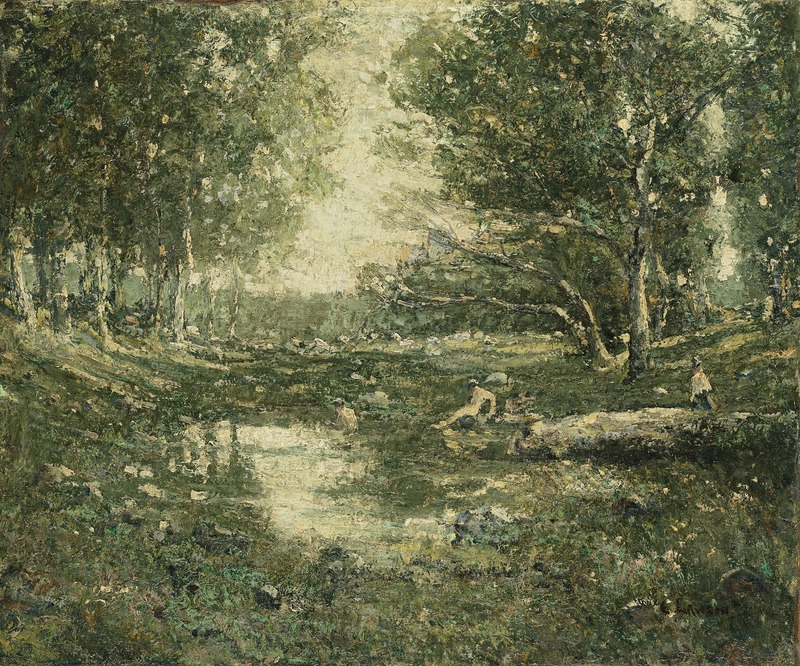 They are often constructed of horizontal bands denoting land, water, and sky, while a delicate network of vertical lines creates foreground grasses and trees that reach past the middle ground toward a hazy horizon. 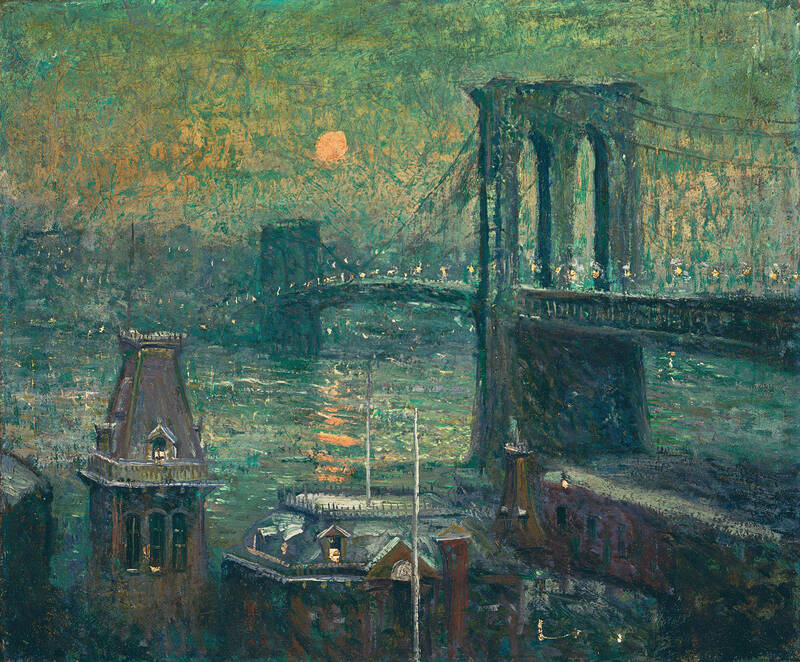 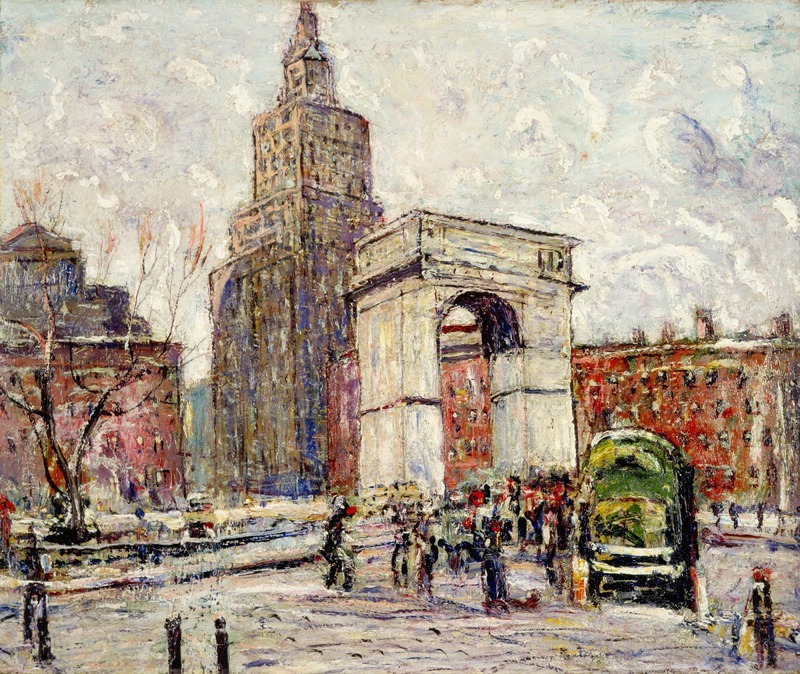 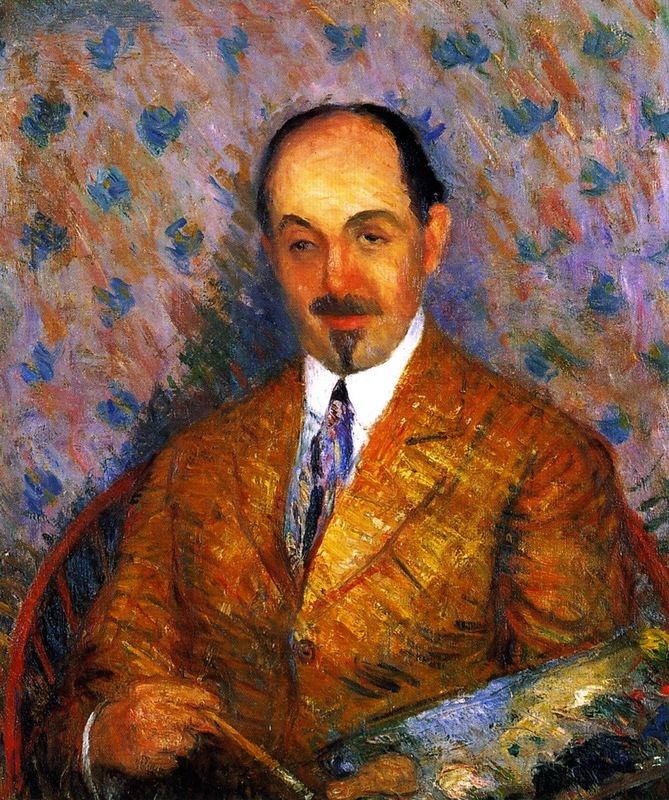 Lawson joined the rebellion against the National Academy of Design when his work was rejected in 1905 and through his friend William Glackens, became a member of The Eight, a group of American artists who were dedicated to challenging the dominance of the Academy. 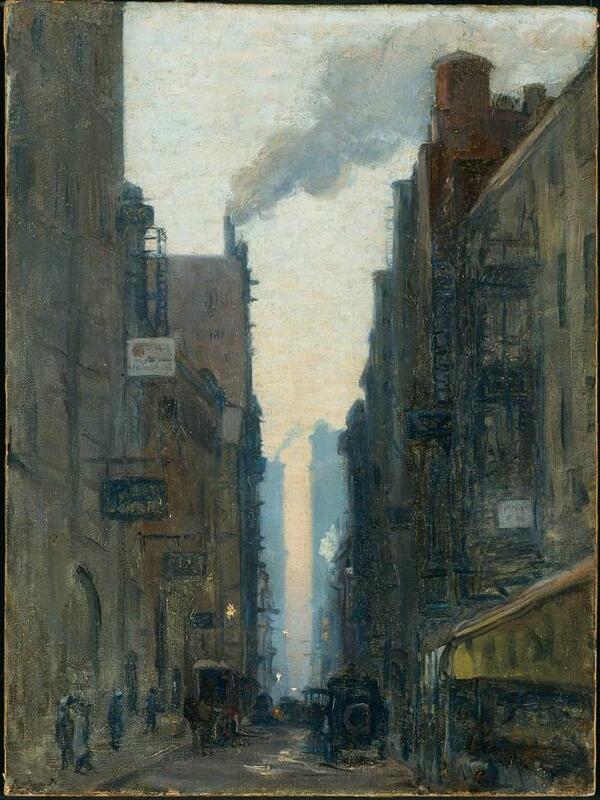 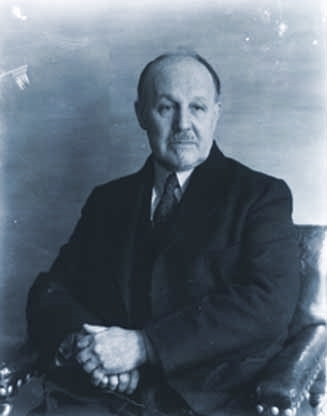 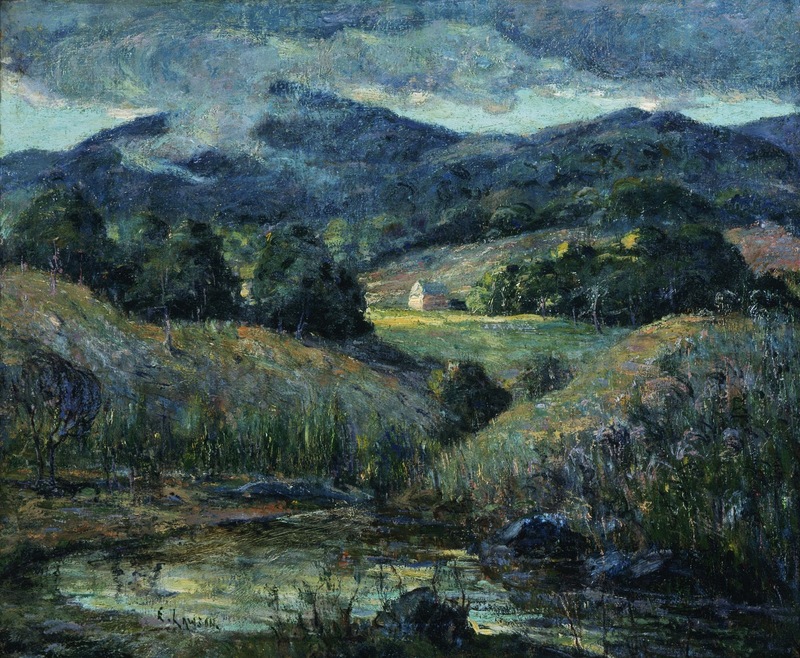 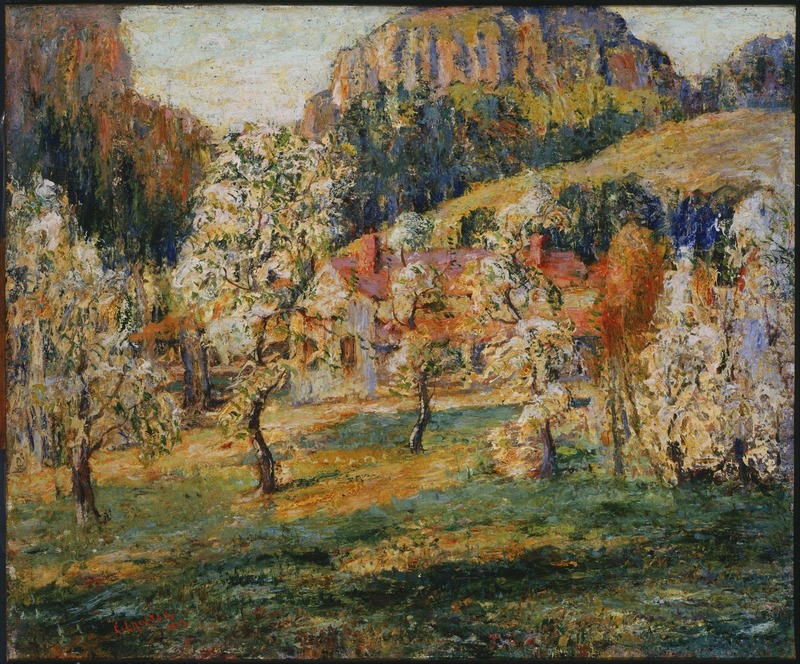 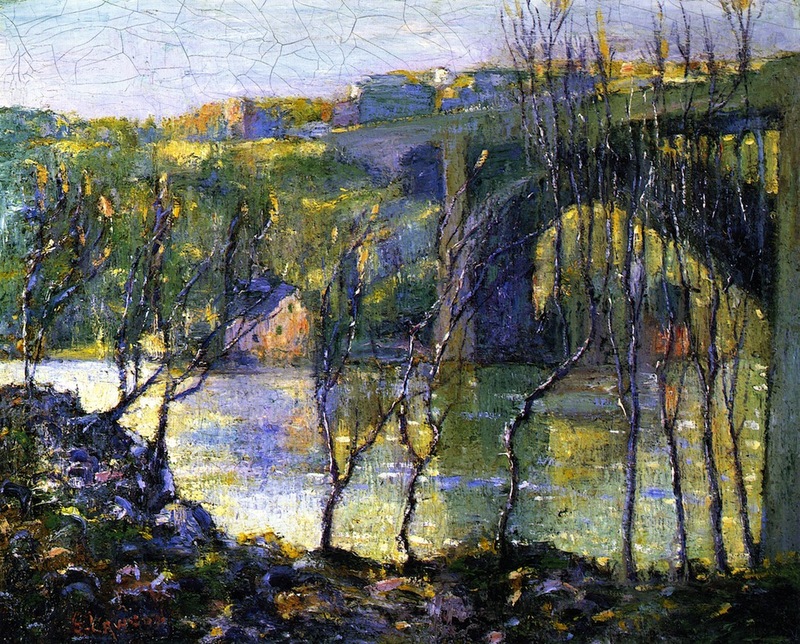 Lawson also participated in the Independent Artists exhibition in 1910 and the Armory Show in 1913. He won numerous awards including gold medals at the Pennsylvania Academy (1907) and Panama Pacific Exposition (1915). 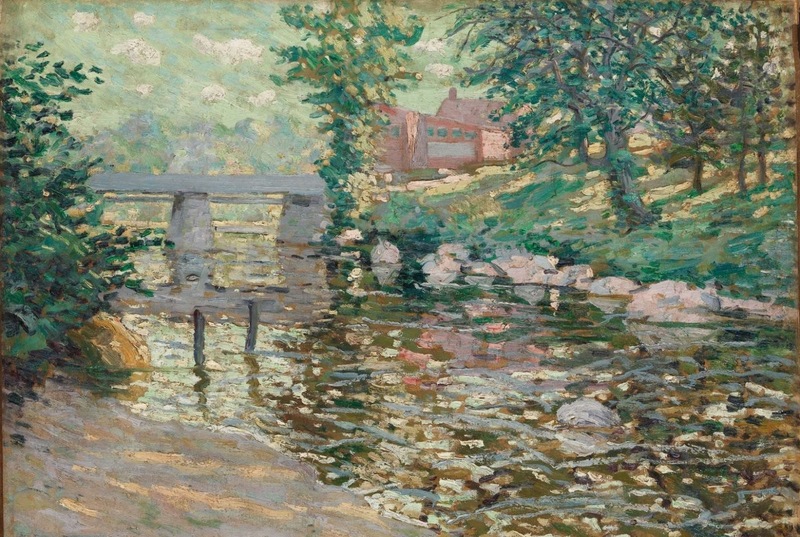 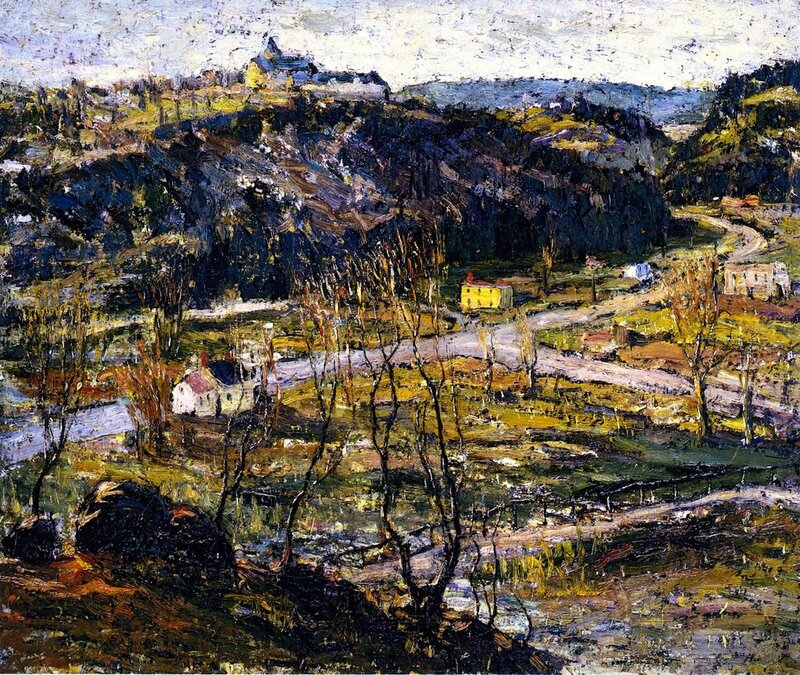 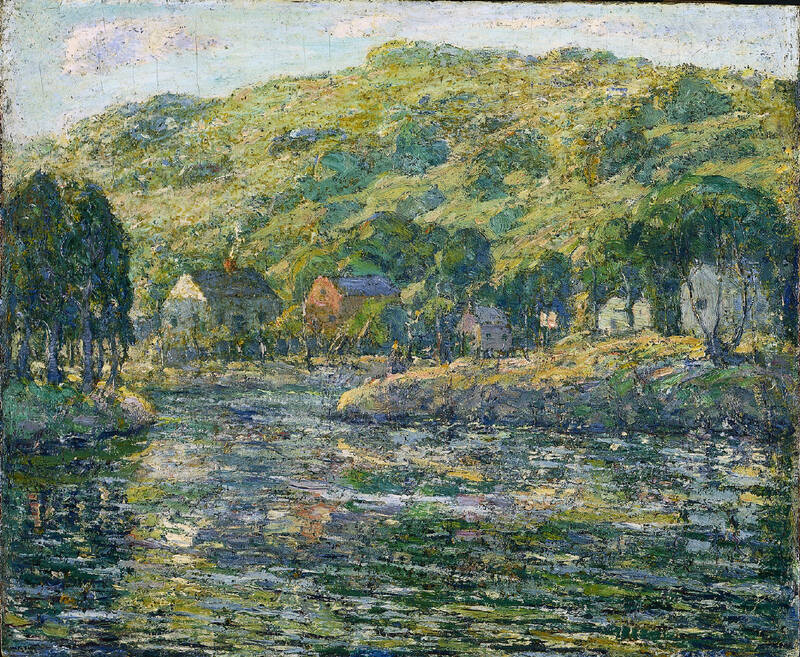 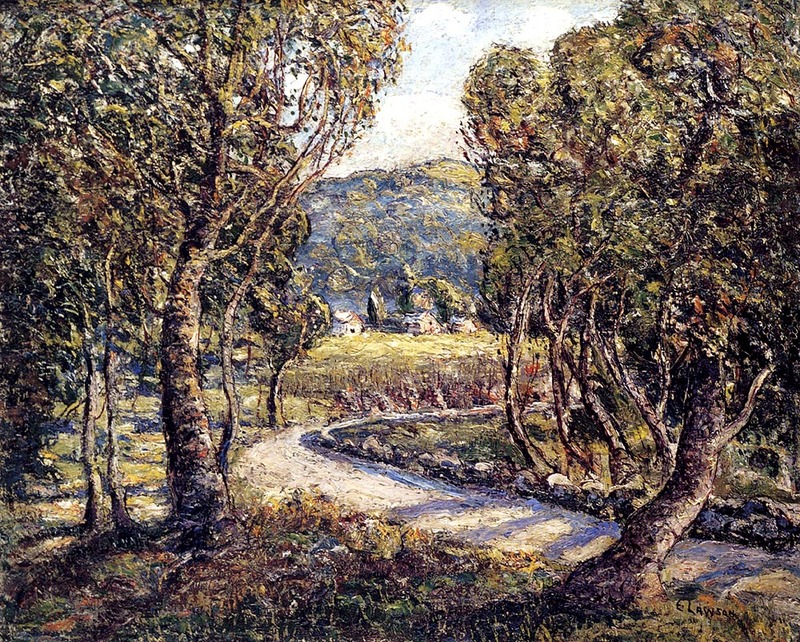 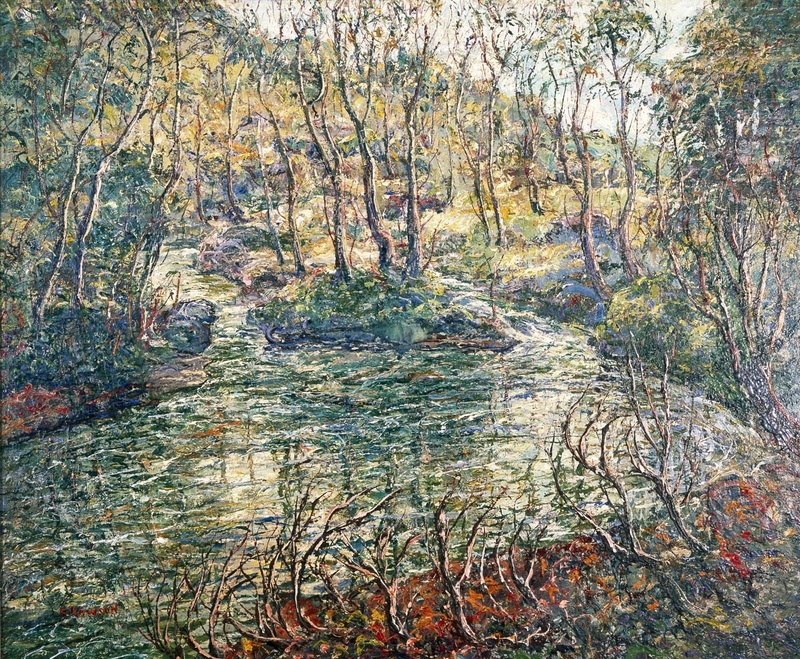 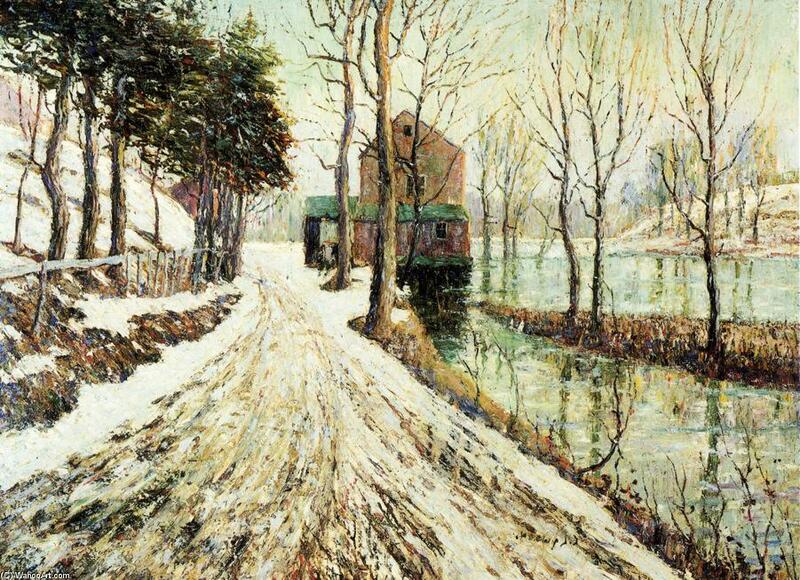 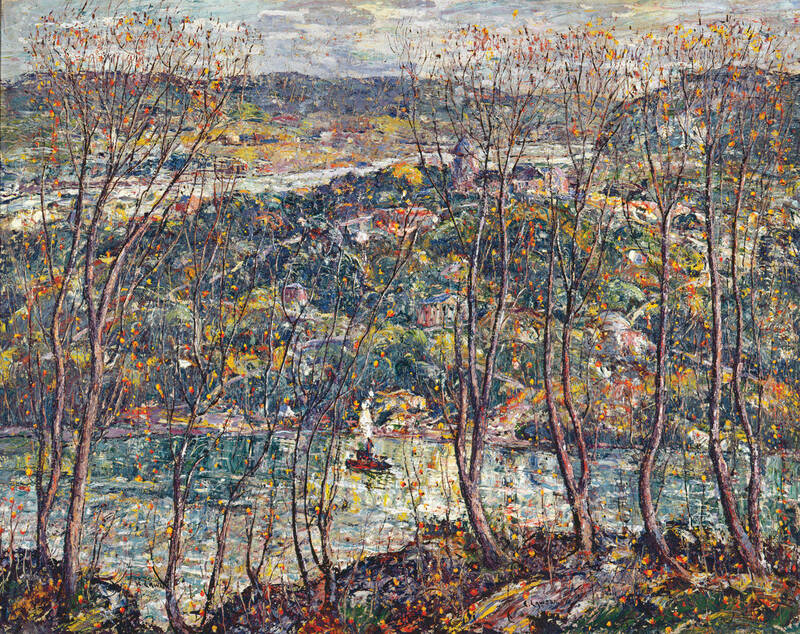 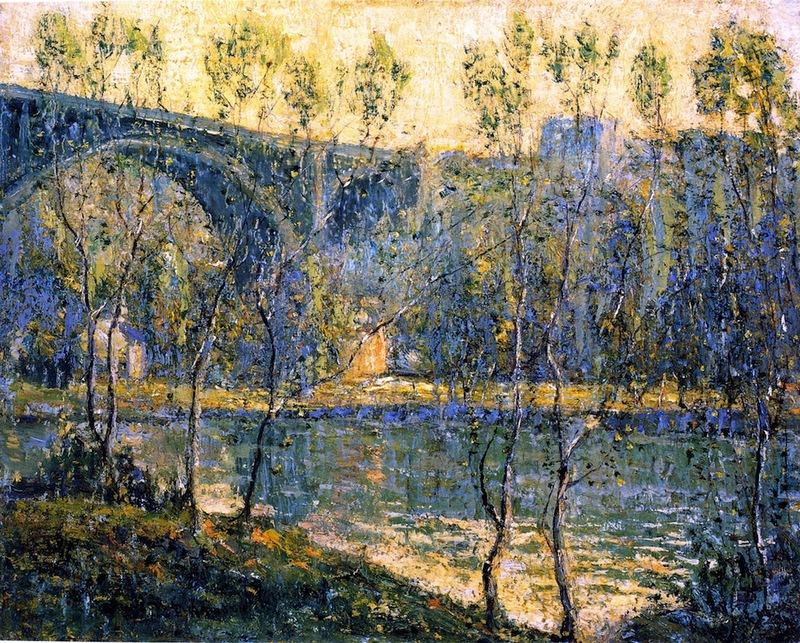 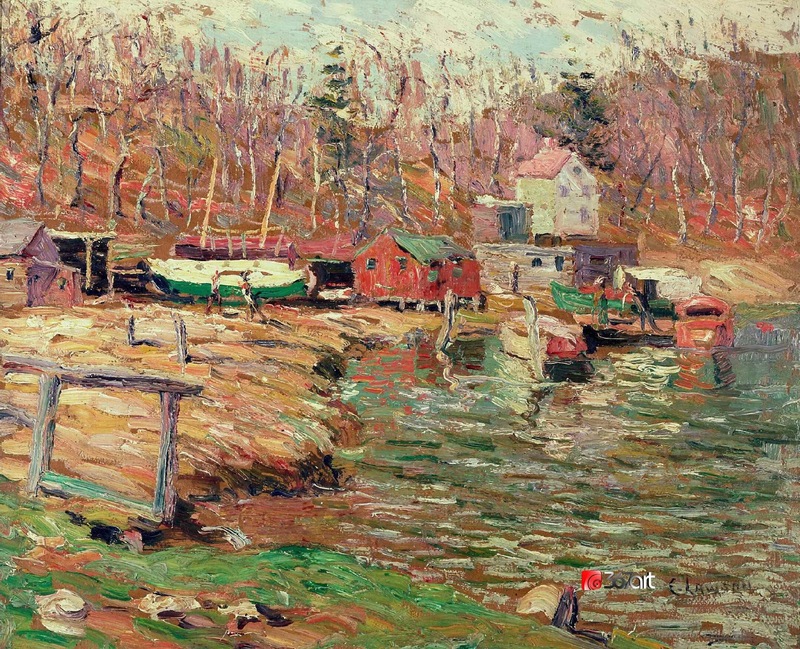 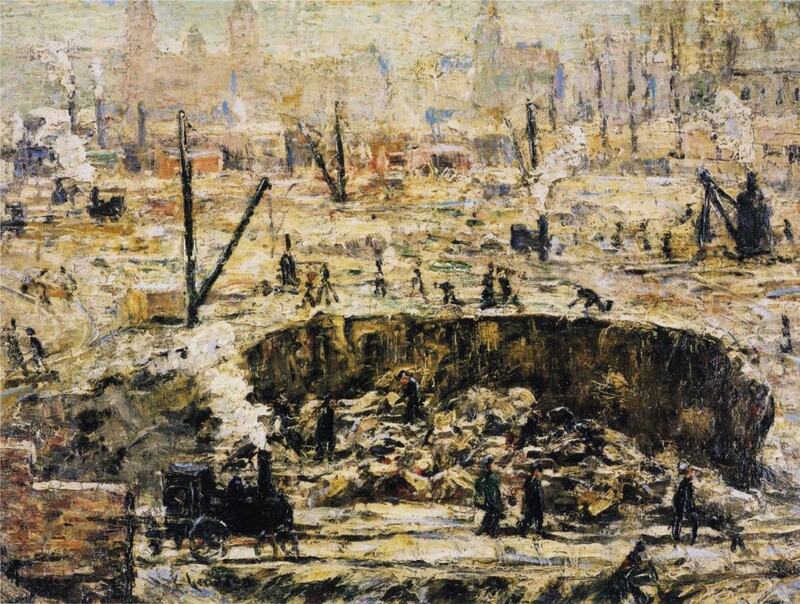 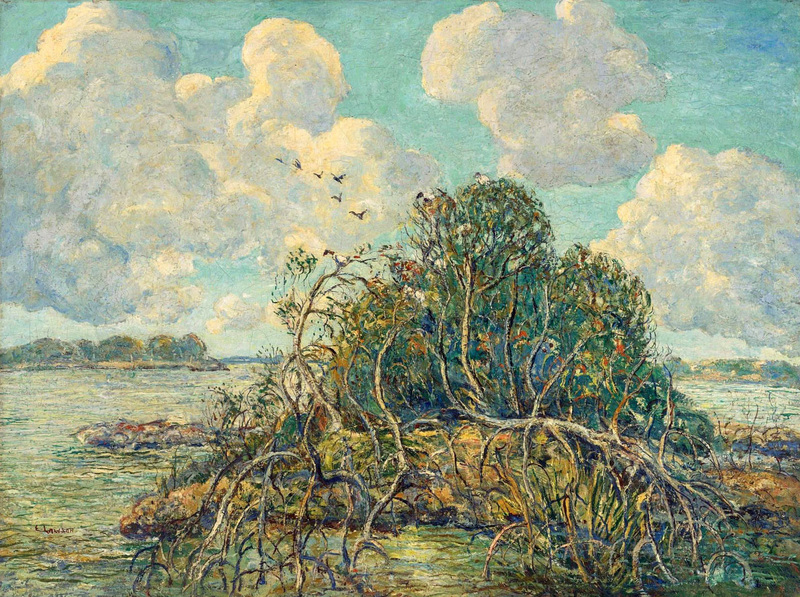 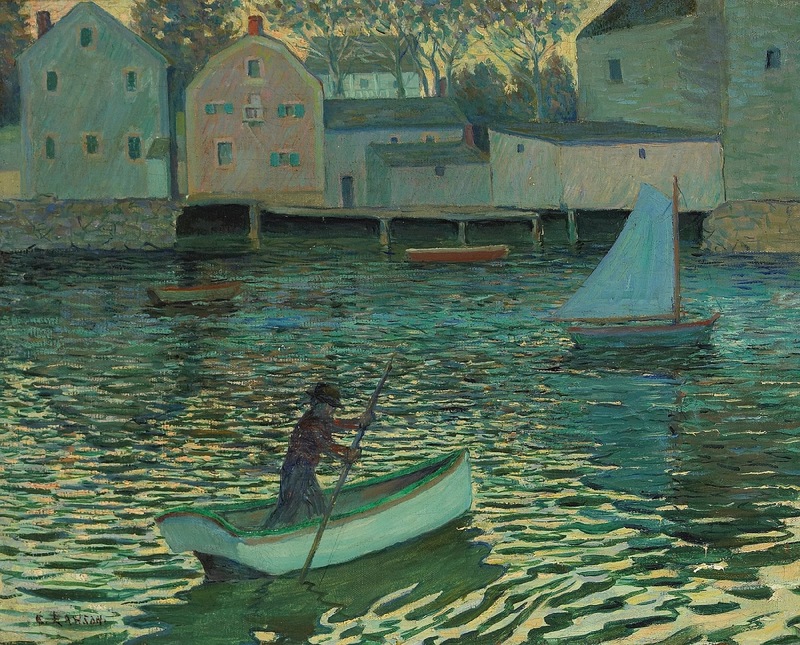 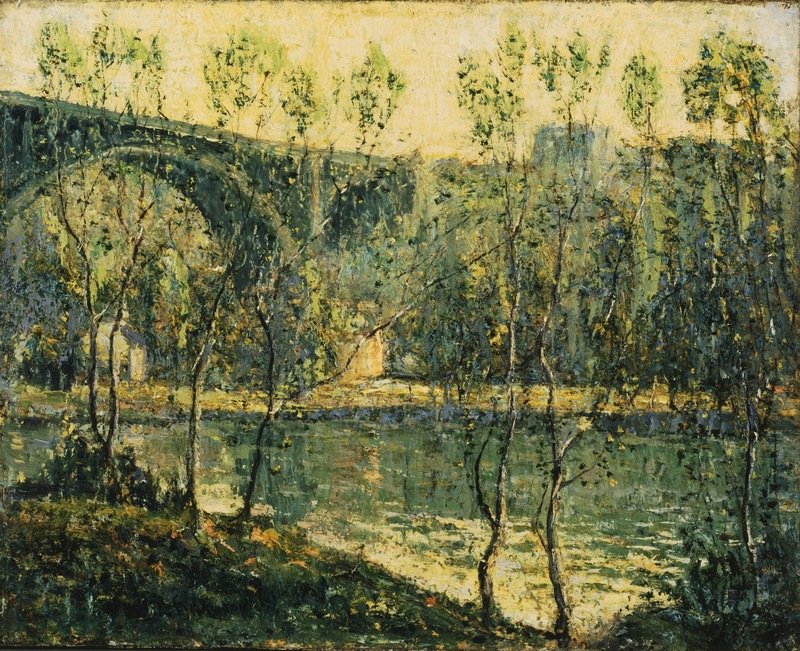 Ernest Lawson (1873 - 1939) è stato un pittore Americano nato in Canada e noto soprattutto per i suoi paesaggi. 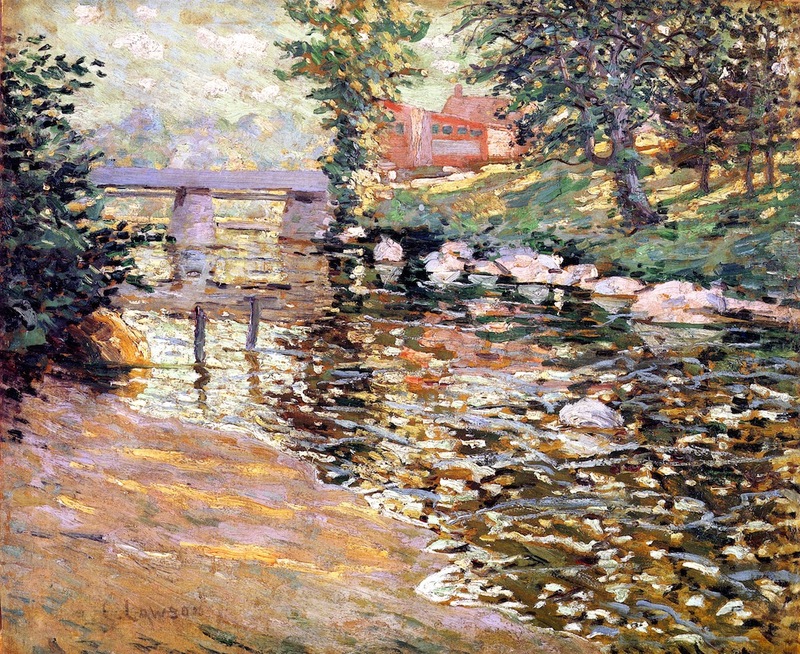 Nel 1888 si trasferisce negli Stati Uniti e nel 1891 si iscrive all'Art Students League dove il pittore John H. Twachtman lo introduce all'Impressionismo. 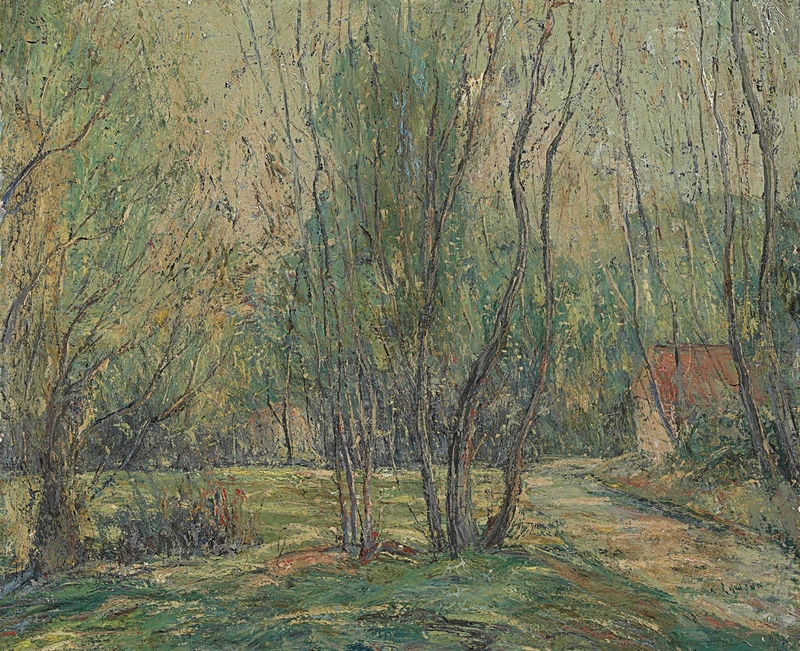 I tre anni trascorsi in Francia, dal 1893 al 1896, gli consentono di approfondire la conoscenza di questo movimento artistico: studia all'Académie Julien, dipinge En plein air ed espone due opere al Salon nel 1894. 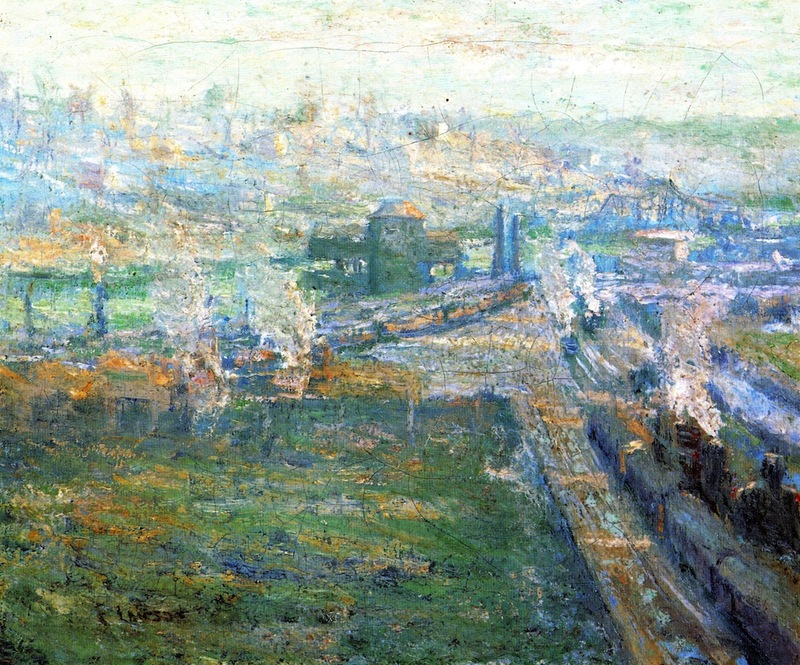 Nel 1896 torna in America ed inizia a formulare una sua estetica personale, incoraggiato da Robert Henri e da altri artisti indipendenti; nel 1908 entra nel gruppo The Eight. 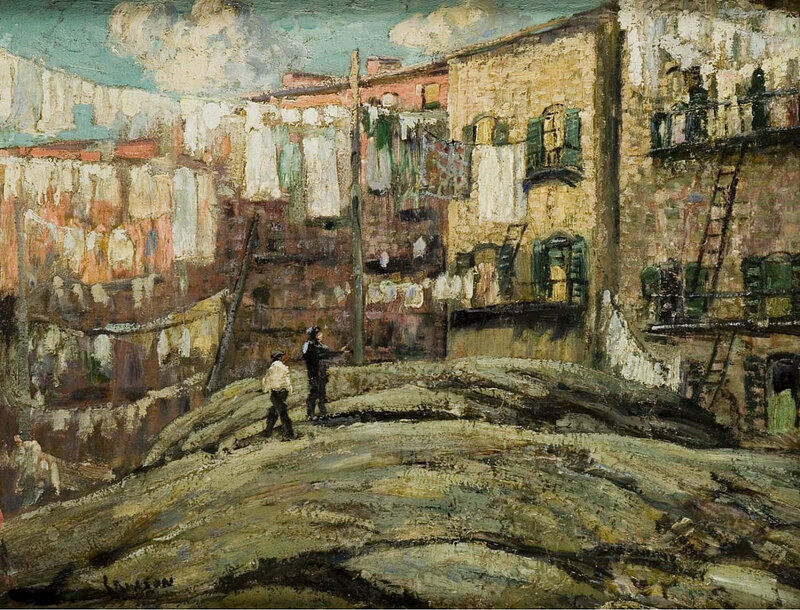 Considerato da alcuni critici il più grande paesaggista americano e nonostante i numerosi premi ottenuti, Lawson dovrà comunque affrontare continui problemi finanziari che si risolveranno solo negli ultimi anni grazie all'aiuto di amici. 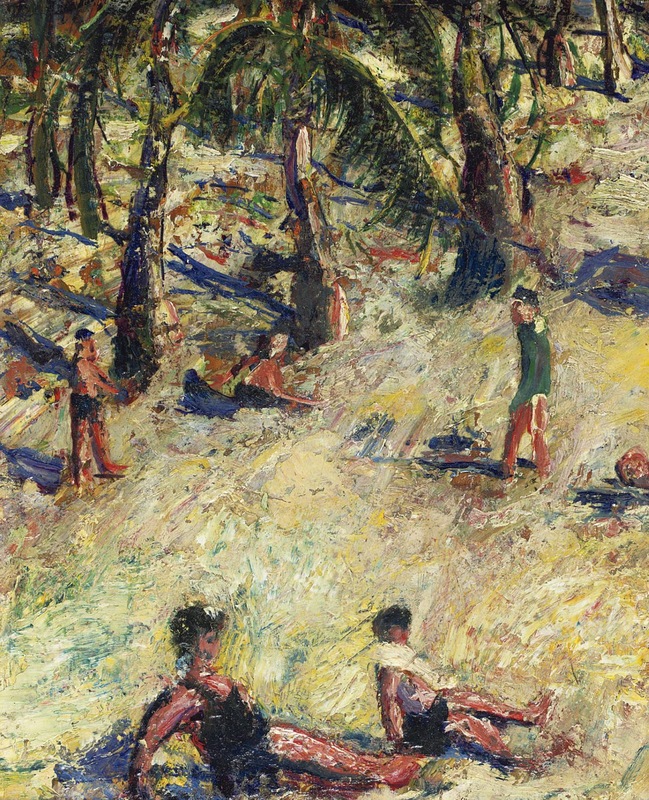 Muore in circostanze misteriose durante una nuotata a Miami Beach.